This month is Responsible Pet Owners Month. And to mark it, Nintendo hired Uggie, the Jack Russell terrier from The Artist, as its official spokesdog. This month is also the Academy Awards. 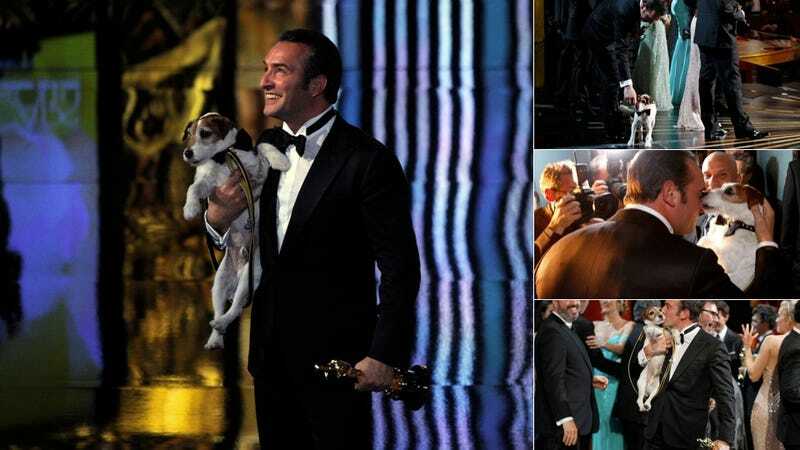 During last night's Oscar presentation, Uggie was on stage as The Artist won the Academy Award for Best Picture. He donned a bowtie and got fed snacks from Jean Dujardin, who won an Oscar for Best Actor. Besides appearing in The Artist and other motion pictures like Water for Elephants, Uggie is Nintendo's first official spokesdog. The pooch is promoting nintendogs + cats. You Know What Nintendo Needs? An Official Spokesdog. BAM! And he also starred in the best film of 2011. Sure hope Nintendo raises his salary or increases the number of doggy biscuits it gives him.